Editor’s note: The date has changed from Jan. 13 to Jan. 17 for this event. 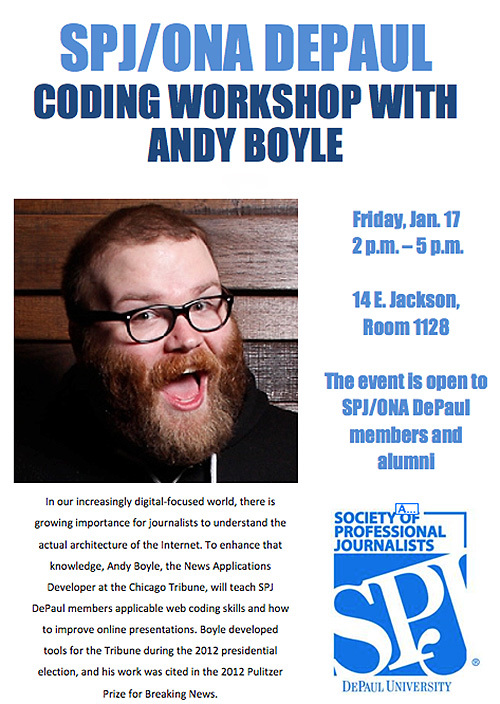 SPJ/ONA DePaul, which is continuing to expand its foundation in technology and training, is bringing Chicago Tribune News Applications Developer Andy Boyle to campus on Friday, Jan. 17 for a coding workshop. This three-hour, hands-on workshop is open to current and former SPJ/ONA DePaul members. Learn how to build cool stuff, enjoy snacks and beverages. No RSVP. Just show up. The event will be on our downtown Loop campus, 14 E. Jackson Blvd., room 1128. Andy Boyle’s bio: Andy Boyle is a News Applications Developer for the Chicago Tribune, where he’s built projects for the 2012 elections, created tools for user-generated content and works on visualizing data. Previously, Andy has worked at the Boston Globe, the St. Petersburg Times and The New York Times Regional Media Group, where his work was cited in the 2012 Pulitzer Prize for Breaking News. When not speaking at colleges and conferences, Andy is usually writing and telling jokes throughout the greater Midwest. You can follow him on Twitter at @andymboyle.